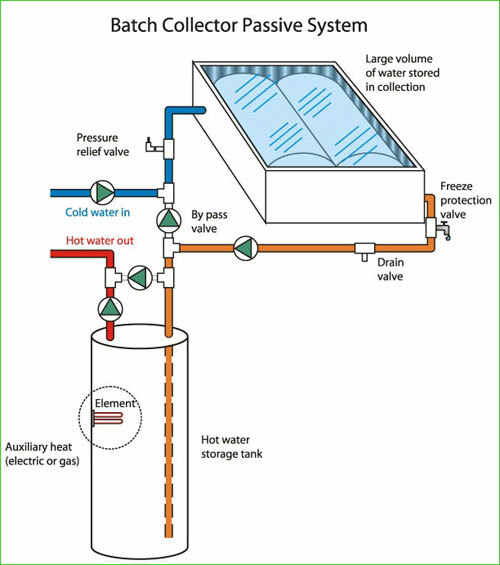 A typical household solar geyser system consists of a solar panel with a heat transfer fluid flowing through it to transport the heat energy collected to somewhere useful, usually a hot water tank or household radiator. The solar panel is located somewhere with good light levels throughout the day, often on the roof of the building. A pump pushes the heat transfer liquid (often just treated water) through the panel. The heat is thus taken from the panel and transferred to a storage container.